You've arrived, and I'm so glad you decided to hop by my blog! I know you've got a lot of blog hopping to do, so I'll try to keep this post as short as possible. Let me start by first and foremost thanking the genius behind the venture that is the Bead Soup Blog Party, Lori Anderson of Pretty Things. She's been going through a lot personally yet keeps on trucking. We are hopping a week later than expected because she simply asked us all to give her some time. I didn't see a single person who wasn't willing to give her that extra week to recuperate. She's just that wonderful of a lady. THANK YOU LORI for just being you and for your ability to bring so many of us jewelry artists and bead makers together. You are an inspiration and please don't ever forget it. 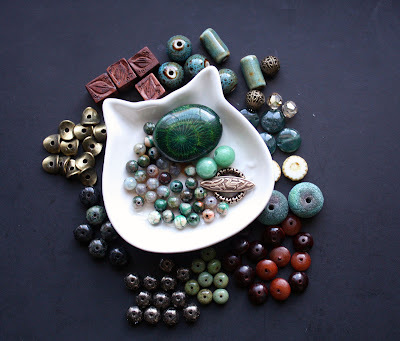 About my soup: my partner for this 7th Bead Soup Blog Party is the lovely Cheryl Foiles of Get Your Bead On. She supplied me with a plethora of her amazing enamel work. Here's a reminder of what she sent. 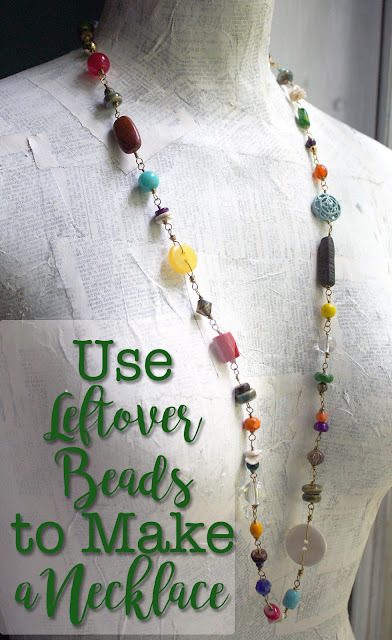 Per the 'rules' of the Bead Soup Blog Party, I really only had to use the focal and clasp that Cheryl provided, but I started a little backwards. While I was letting my soup simmer and trying to work through some of the other goodies that were already on my desk, I happened upon a bracelet focal from Cindy Cima Edwards of Zimaj. I pondered what beads of mine would go well with it and the image of the beads in my soup sprang to mind. Along with some lampwork beads from SueBeads that I've had for ages and some copper bits, this bracelet just fell together. 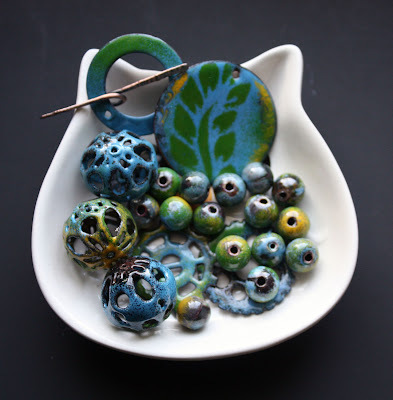 While those green lampwork glass beads were out, a couple other SueBeads creations caught my attention and again seemed to fit perfectly with the enameled beads in my soup. It wasn't long before these earrings were in my hot little hands. I knew I needed to focus on my focal and clasp before I used up all the coordinating beads Cheryl had sent. I pondered the focal for a long time before finally deciding to frame it with some copper wire. Once the frame was made, it needed just a tad more. . .something. So, I went a bit bonkers making dangles to hang from it. With all the dangles on there, the focal was a little heavy so a simple chain and the gorgeous toggle was all that was needed to complete the necklace. I'm not completely pleased with my construction of the frame around the Cheryl's beautifully enameled charm and may re-work it later so it's not so wonky and cumbersome-looking. However, I am quite pleased with the design idea. I still have the large filigree balls and the cogs that Cheryl sent to play around with and can't wait to come up with some designs for them at a later time. Thanks again to both Lori and Cheryl. It's been so much fun once again. I'm looking forward to hopping around the other blogs and seeing all there is to see. Make sure you take the time to hop over to Cheryl's blog and see what she created with the Bead Soup I sent her. Here's a list of all the other participants for this round so you can get your blog hop on! Thanks again for hopping by! This may be a repeat, but it told me to try again so here it goes. I adore the green bracelet. All your pieces are beautiful though. Good luck getting the necklace where you want it. I like how they almost cover the ring in your one photo. Wonder if you could wire them to the frame like that? You really did justice to your soup! great work! I love the enhanced pendant design with the multitude of charms :-) Have you considered wrapping thinner gauge wire in between sets of charms so that you get the sunrays effect with the beads evenly distributed like in the first photo where the pendand is lying flat. Great way to use the focal! necklace is the best!! !creative and elegant!congratulations! Clare- Thank you so much! I love that you were able to take some time to hop by here. I do appreciate it. Claire- THANKS! 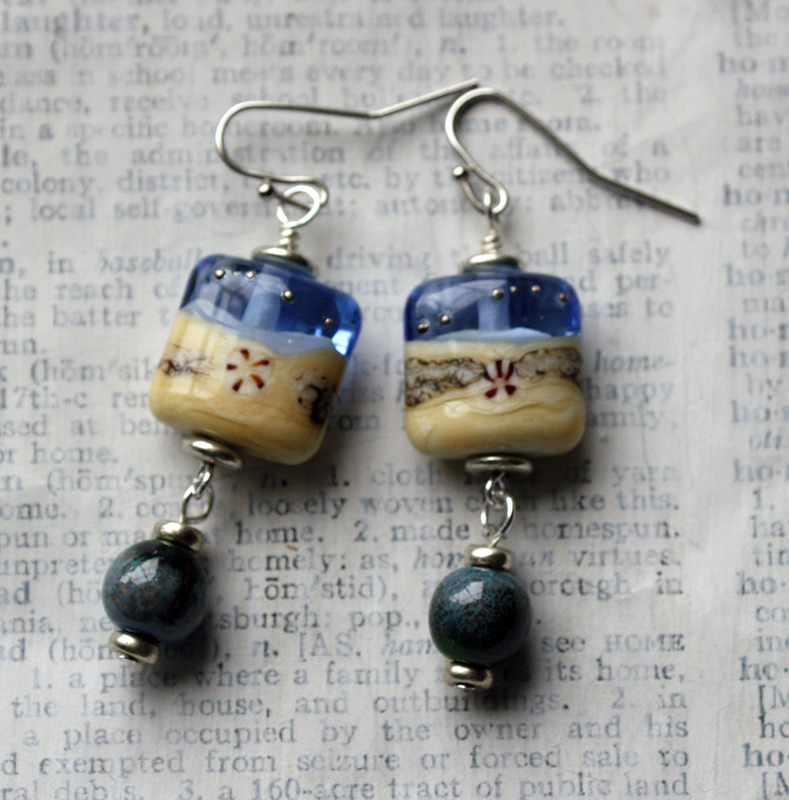 I had a blast designing with Cheryl's enameled pieces. She spoiled me with them and made it so easy to design my creations. Every piece is beautiful and unique~ fantastic work! Love the color palette of your soup and the pieces you created..
Bracelet and earrings mmmmm yummy. I think I like the beads all dangling from the bottom of the focal instead of spaced out around it (like when its layed down). The combination of the bare wire next to the focal is very appealing to me, and then wowza a bunch of jingle jangle beads hanging down. I love your use of the soup, creative and beautiful. Great work. I like the framing of the focal. love all your designs and I really like all the colors/danglies surrounding the focal. Your bracelet is gorgeous. 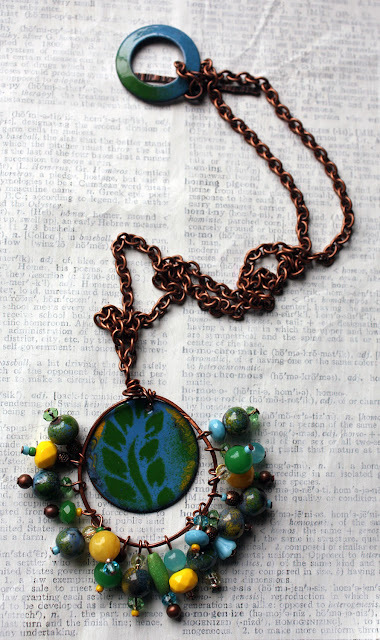 The necklace looks like a piece I would wear for Earth Day.. Very beautiful.. Awesome job. Love how you framed that focal pendant with the frame and dangles - love it! The bracelet is awesome - love those greens! That was just a bowlful of inspiration Cheryl sent! And your designs are so much fun - especially love the green bracelet. You have to promise to show us what you make with the rest of the soup. love your bracelet and necklace. Beautiful! Very nice pieces. The necklace was unexpected and inspired. Beautiful soup ... fantastic works! Georgeous pieces! what a great soup! I love all your pieces, bracelet is my favourite! I love the necklace design. this is my 3rd BSBP, I'm on the 3rd reveal... it is totally funny this party! Love your pieces and especially how you used the focal! Beautiful bead soup!! Love it. Dont think you should change a thing. Love how brought out that little dab of yellow and made it sing! Yummy - all that enamel. And those blues and greens together. Another combination that I love. Great job. I love the simplicity of the charm necklace. It should be very easy and fun to wear. Great job! Hope, I love all of the dangles on the necklace and that green bracelet is gorgeous! Nice work! Oh that necklace totally speaks summertime to me I'm so craving some hot sun on my face! I started the same way with some of the other fixins and got a little concerned about getting too far off track but I love where you took things in that part of the journey too. I also think that little kitty dish is pretty much the greatest thing every. Fantastic job with you soup...your pieces are lovely! Great job Hope!! The green lampwork bracelet is so gorgeous!!! Very fun soup and lovely use of color! Hope - I LOVE what you did with the enamel pieces I sent. The green bracelet and the necklace are my favorites. Like others have said, your frame around the pendant is wonderful and really sets off the piece. I feel like a proud mama looking at all the wonderful goodies you made with the enamel components. Great job!! So glad we were partners for this BSBP!! Kathy- Yay! I'm so pleased you like it framed. It was one of those lightening bold idea moments and it's awesome that it actually worked out. Thanks! Karin- Oh yes, Cheryl really gave me some fab soup to work with. I will definitely try to make sure I share my creations for the rest of the soup. But first to come up with something that will do them the justice they deserve! Thank you you kind comment and stopping in! Ilenia- You are too kind. It was a great soup indeed. Thank you! Jo- Thank you so much for stopping in and your sweet comments. I can't wait to see what you've create on Saturday! Thanks again. Judith- Cheryl really did spoil me with her enamel beads and the colors she sent. Thanks for coming by! Patricia- Thanks so much! I appreciate your kind words. Kristin- It was fun and such a blessing to have gotten a beaut of a palette from Cheryl. Thanks for popping in! Oh delicious! All your pieces are yummy but the necklace I liked best. What you did with the pendant is so ....fantastic. Love it. My soup is still cooking. I still have until20th to let it simmer. But don't you forget to drop by that day. What a beautiful soup you had to work with - and such gorgeous pieces you created! 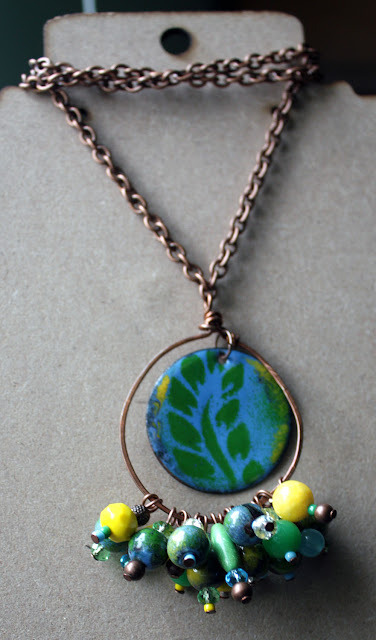 I especially love the enameled pendant necklace - WOW..it is so stunning and looks like it would be so great to wear! Hope - such great pieces - love the designs and colors. Great job!! Wow, I love your design ideas, specially the necklace! You have great colors to work with too. Fabulous job! Very cool designs, Hope! I really like your green bracelet - that's awesome. I also really like the pendant necklace.I think it's looking really good, but I know how you feel (possibly reworking it) because that's how I felt w/one of my pieces I've worked up for the 3rd reveal next week! And as always - love your earrings!! Shel- You spoil me so with your kind comments. I'm glad you understand my uncertainties about the necklace. I'm actually wearing it today to try to get a better feel for my thoughts on it. I cannot wait to see what you've created. Thanks for your sweet words and for stopping in! I do appreciate it! I love the green bracelet. You cooked up a real nice soup!! Thanks for stopping by fairiesmarket too. Beautiful work, love the green bracelet. Everything is very creative. I love it all, Hope! Three beautiful designs. I love the necklace and what you've done with the pendant - it's gorgeous. Great work. Beautiful designs. I love the green bracelet and the earrings. Great idea with framing the focal and adding all the dangles for the necklace. Original and cool! Nan- Thanks so much for your kind comments. I'm pretty pleased with what I made too. It's not exactly my usual 'style' but that's kinda the fun of the BSBP. Thanks for stopping by! Beautiful work! I absolutely love the pendant that you created for the necklace! I love how the beads look splayed out around the pendant in the first photo of the necklace. My first thought was children holding hands around an Earth. I think I still have Earth Day on the brain. LOL. I came back by your soup to look again, I love your pendant and the way you splayed out the dangles in the first picture. 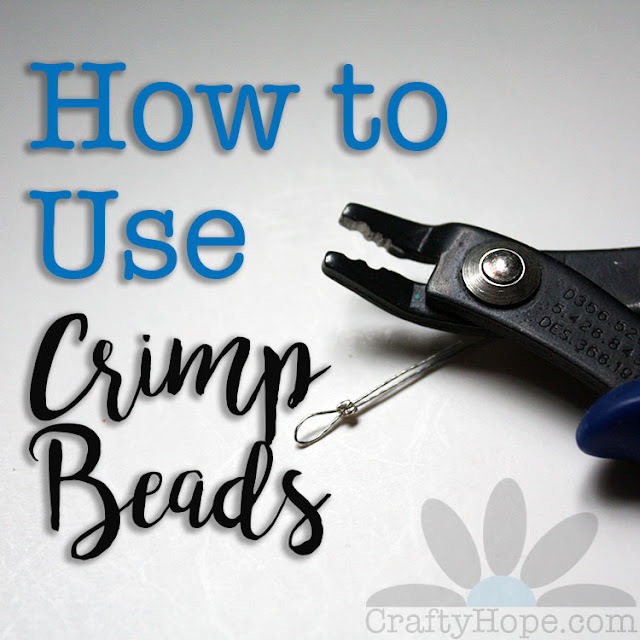 I read about the wire wrapping and thought that was a great idea, but then I had this thought the other day, what if you used a bead (glue in place) between the dangles? I don't know, but in theory it would work!! Love your pieces. Hope all 3 of your pieces are great. The pendant frame on your necklace is very creative. Aren't enamel components fun? I just got some and I'm anxious to play with them. Marie- Thanks for coming back by. It's funny, but I had the same thought about the beads between the dangles. I'm still thinking it over really. I wore the necklace the other day and was really happy with the way it felt on, so I'm in no rush to change anything quite yet. Thank you for the suggestion!! Sarah- Thank you so much for your sweet comment! Pliers and baggies are a big unifying factor amongst beaders I think! :) I appreciate you taking the time to come by. Thanks. I am so stinking far behind on working my way through this soup...but I couldn't speed through your post, because your pieces demand to be looked at carefully and admired appropriately! What a lovely job you did to highlight the beautiful enamels you got, each in its own special way. The necklace is such fun - the clasp is to die for! Yep. I am running behind again but I just had to let you know how much I love your creations especially the bracelet. It is just gorgeous. Great colors! That emerald green bracelet is beautiful! Hope, what a lovely gorgeous soup you received, and oh, my, what lovely gorgeous pieces you created! The earrings are simply adorable, and the necklace turned out fantastic - I love the way those dangles pull out the colors in Cheryl's stunning focal! My very favoritest (is that a word?) piece though, is the bracelet - the colors and details just call out to me - it is exquisite! Can't wait to see what you do with the filigree beads! I really like the focal you put together, I immediately fell in love with it. Your soup is lovely and I love what you have done with it. Michelle- Thank you! Yeah, I totally got some great colors to work with. I appreciate you taking the time to hop by! Angela (Jeweled Inspirations)- Thank you so much! Cheryl definitely gave me some beautiful pieces that fueled my inspiration AND were fun to work with. It was a pleasure playing with all of it. I'm pleased it came together so well. Thanks for hopping by! 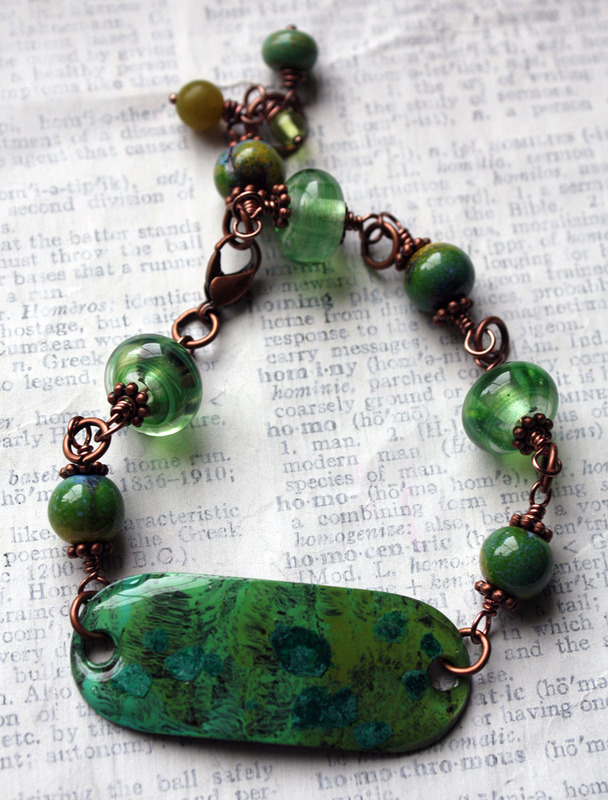 Love the combination of copper and green - simply stunning! And how cool is that necklace of yours? Super cool! Having those little dangles jingle and jangle as you move would be so much fun. adlinah- Thank you! I do enjoy the dangles, though they do weigh a bit. I'm glad I stopped where I did with them ;) Thank you for stopping by! I love the bracelet! (I do love all of your pieces) You're off to a good start with your wirework with those links. Can't wait to see future designs! Hi there, thank you so much for stopping by my blog. I am so glad you did because now I've found yours too! Lizzie- Thank YOU for stopping in. I'm so happy you like me creations. Cheryl gave me such a fun soup that it wasn't hard to create some cool pieces. Thanks again! I love all your pieces - so pretty! I think my favourite is the last necklace - but it is really hard to choose, they are all beautiful. Moon and Seven Stars- Thanks so much. I had a lot of fun being inspired by what Cheryl sent me. I appreciate you stopping in! I actually really love that frame! Anything with movement is a favorite of mine, and I've been into framing pieces to go BIGGER lately. Thanks so very much for being patient with me, and I seriously hope you'll participate in the 8th BSBP!